You've read all about my European adventure now, and what I'm sure you're all waiting for is to hear how many Untappd badges I got. Before revealing the exact total I will say it's a lot more than you'd usually read about in one of these Catchup reviews. So I've come up with this, there will be differing levels of detail provided for different badges/beers but if you refer to the relevant country review it should hopefully be able to fill in the gaps for you. If you are still after more information please feel free to email me and I'll do my best to help you. Holidays, for me at least, always seem to bring about a whole host of new lagers that I've never tried before. This one, despite how much craft beer I found, was no exception. Nine (9!) Lager Jack badges attest to that. It started in Austria with Wiener Original unlocking (Level 42) and finished in Liechtenstein when Swiss beer, Vollmond Appenzeller, unlocked (Level 50). Brew Traveler is a badge that has perpetually confused me. It's supposedly for checking into beers in different states and countries - but two check-ins in different suburbs sometimes trigger it? Anyway a Wieselburger Gold in Vienna, a Kronenbourg in Paris. a Cardinal Speciale in Geneva and a Tripel Karmeliet in Brussels unlocked (Level 8-11) of this badge. The Summer Fun badge is a relatively straight forward one. To earn this badge you need to check-in to 5 beers with the word "Summer" in their name. A Viennese microbrewery, 1516, provided the beer with their Grapefruit Summer Wit. It was quite an impressive beer. It had light banana notes combined with good grapefruit flavours, with only moderate bitterness. Where there's lager there is usual the odd Pilsner. Slovakia's main lager, Zlaty Bazant is a proper Czech Pilsner. Sampling it in the summer sun in Bratislava was a great experience. Crisp as Day (Level 11) was the badge that it unlocked. While Corgon 10, another Slovak beer, and Cardinal Especiale also unlocked levels of Crisp as Day throughout the trip. Czech it Out was a badge that eluded me for far longer than it should have. This is a badge for drinking beers from the Czech Republic, one of the world's best beer producing countries. The beer that finally unlocked it for me was Staropramen Tmave, which I had at the Red Stone Castle in Slovakia. It's a really nice Euro Dark Lager, the style that first got me into craft beer. Before you ask, I did not find New Zealand craft beer in Bratislava! Panhead's Boss Hog is one of the Tru Bru bottles that came with me from home, in case craft beer was scarce - which it wasn't... This was an interesting IPA with quite a lot of vegetal qualities, which normally don't work for me. Any way this was the only time I unlocked Drink Like A Kiwi and it was (Level 21). Heffenista (Level 7) arrived in one of Budapest's finest craft beer shops - Csak a jó sör! The beer was from a Hungarian micro brewery; armando_ochtoa. It was called a "semi-dark Hefeweizen", although I struggled to work out where the semi-dark was coming from; it was only a little darker than a regulation Hefeweizen and certainly tasted like one. Better Together is a badge that has been long over due, collaborations are one of the great things about the craft beer world. Vari Noverek was an easy drinking Pale Ale between two Hungarian breweries; the aforementioned armando_ochtoa & Szent András Sörfőzde unlocked (Level 2). While Extraomnes (Italy) and Stillwater (U.S.) was a wonderful saison that unlocked (Level 3). I can't wait to unlock more of these, I love collaborations! By the Campfire is a relatively new badge for drinking beers in locations considered to be outside. A Kronenbourg 1664 in Aix-en-Provence brought up (Level 3), whilst an Orval (god it's good!) in Brussels was enough for (Level 4). The Lervig Sour Suzy I had at the Tour de France unlocked (Level 5), I was disappointed with this beer it just wasn't quite sour enough! Get Radical's Mars Needs Women was a brilliant Bretty Saison packed full of honey. It earned Pucker Up (Level 19) and was one of many impressive offerings from these guys. The brilliant sour producer that is Cantillon provided beers for (Level 20 & 21), whilst that Lervig Sour Suzy that you've already heard about wrapped up (Level 22) at the Tour de France. Keep Your Wits About You is a badge for drinking Witbiers. They were in relatively short supply throughout Europe, as I only unlocked 2 levels of this badge (Level 3 & 4). The first was La Trop's Blanche from St. Tropez. It was pretty light on flavour and body but perfectly drinkable. The second was the wonderful Blanche Hull Melon from Brasserie de la Vallée du Giffre - this beer would be sooo good in our summer! La Trop got their second beer in this monster Untappd Catchup. Their Ambree unlocked Paint the Town Red (Level 2). This was a better beer than the other one of their's that I tried. It had the flavour of a full amber, something I'd missed while I was away. The body of the beer was a little thin, but I think in the French summer heat it was a blessing that it was thinner rather than heavier. It's fair to say that I'm not really a cider drinker. That said I won't turn one down when it offered to me. At Brasserie de Monaco they had a cider on their tasting paddle. I'm not going to profess to being a cider expert, but I quite liked this one. The colour was very distinctive, it was very effervescent and it wasn't sweet. It was quite refreshing on a hot day. Going Dutch is a pretty straight forward badge, drink 5 Dutch beers to unlock it. 8.6 Absinthe from Bavaria Brouwerij was the beer to unlock (Level 2). I bought this as a joke for Lizzie and was better than I expected it to be. It's quite herbally, similar to Absinthe, and doesn't have much overt sweetness. It was also not particularly hot, despite it's 8.3%. It's a good novelty beer to split. Find the Source (Level 5) was the first badge I unlocked in Milan. It was actually the first beer I had in my walk around Milan! It was at this bar called Beerbacco, which is strangely classified as a brewery (I confirmed they don't brew on-site). The beer was Kamaleon from a brewery called The Wall. It was an American Pale Ale, but was lacking in hops and tasted a little watered down. A disappointment! I had feelings that The Gondolier badges would flow in Italy. That they did as well with (Level 5-9) all being unlocked - in 2 and half days... Trübes Weiss kicked it off at Beerbacco. A trip to Baladin Milano was good for (Level 6) with their wonderful Isaac (how many breweries have a Witbier as their flagship beer?). Farnese Chica was quite bland, while Trhibu IPA was apricotty. Last but not least was the Hoerdum Moka, which was a nice coffee stout. As mentioned in the earlier wrap up of my Italian holiday - Suds Samba has finally arrived! This is the badge for drinking Brazilian beer, they have a thriving craft beer scene but very little of it makes it outside of Brazil. I've suffered through 5 lagers (one a Black Lager) to be at this point today. Skol is the beer that unlocked it and is consistently on the most consumed lager in the world list. A beer I already talked about in the Better Together badge above, unlocked Trip to the Farm (Level 10). 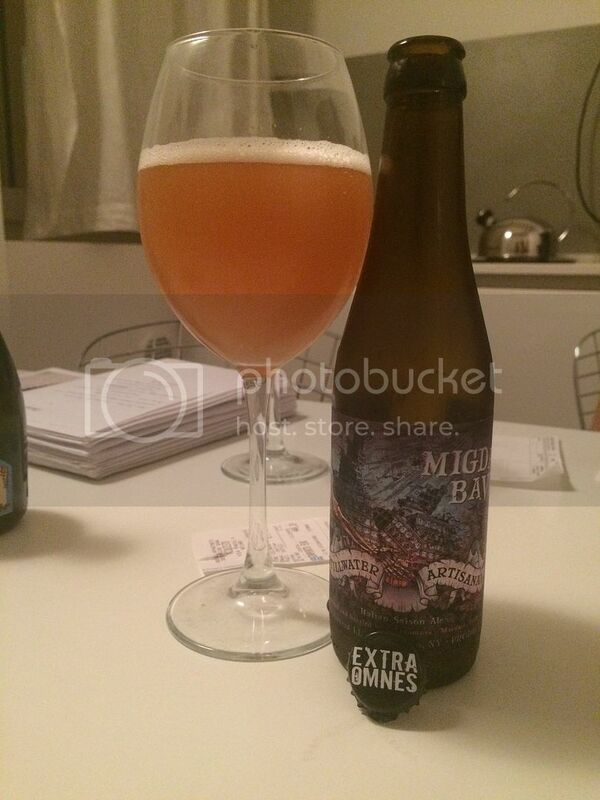 The Migdal Bavel from Extraomnes and Stillwater Artisinal Ales. Stillwater are lauded worldwide for their Saisons and this was no exception. The was wonderful! It had this wonderful spiciness to it and was very very drinkable. This is a collaboration that I hope makes it out our way soon. New Brew Thursday... I was so pleased when I hit Level 10 and thought you were gone forever, Not to be though and so he we are with New Brew Thursday (Level 14). It arrived in Milan at the start of what was to be a huge day of drinking. This was a very apricot driven IPA, not like an I can recall. I enjoyed that the IPA was called Trhibu and was brewed by Hibu. One of the badges with the longest name is Dubbel, Tripel and Quad Oh My! As the name suggests it's for drinking Dubbels, Tripels and Quads. I earned two of these on my travels (Levels 2 & 3). The first was the Extraomnes Tripel, which was sensational! The second was the Staffe Hendrik Wild Tripel, which I had in Belgium - which I thought was a really interesting take on a traditional style. Heading into my trip I didn't think I'd be unlocking a couple of different levels of the Beer Connoisseur badge along the way. The first was the Moroccan beer, Casablanca (a full review of which you can read about here). The second was Presidente from the Dominican Republic. Both of these beers came from Drinks of the World in Geneva and earned (Level 14 & 15) respectively. One of the world's finest beers earned Sky's the Limit (Level 10). That beer was Trappistes Rochefort 10. I couldn't quite believe that I haven't reviewed this yet - something I will attend to as soon as possible! This beer is simply spectacular! It's a spectacular mix of sweet maltiness, dark fruits and spices. I can't recommend this highly enough. Big Stouts and Porters were definitely off the table due to the prevailing weather conditions throughout my trip. Hence it wasn't a surprise to end up with just one new level of the Heavyweight badge; (Level 33). The beer was La Nebuleuse Malt Capone; these Swiss brewer's really know how to brew! This was lovely and chocolatey without being overly sweet. Fruits of Your Labour (Level 2) was wrapped up in Brussels. Rince Cochon, who'd let me down so badly in Nice, was the brewery who provided the offering. The beer was their Rouge; a strong (7.5%) fruit beer. It had this medicinal flavour, that reminded me strongly of children's panadol, and showed almost no signs of the ABV. It's not really my thing but I can see the appeal. Bush Ambree was quite a nice amber ale that I had little idea that it was 12% ABV. This was the first beer we had at our Hotel in Paris and it unlocked Hotel Hopper (Level 6). I wouldn't rush out of my way to get it again, but if I was handed it I'd happily share it with someone. It's well crafted to somewhat hide the ABV, but it's not something that I particularly enjoy. Normally I love it when Untappd releases new badges; not the latest lot though! My first day in Italy, after over 2 weeks in France drinking plenty of French craft beer they released a badge for drinking French beer; Creme de la Creme! Never fear though, I still managed to notch up 3 Levels with La Rioule Simcoe (1), La Levalloise (2) and La Debauche India Sout (3). Read all about these beers in my France Part 5 review here. Thank god I've finally finished this review! It's taken over a month to finally get this all done. Europe provided 31 different badges which you can see above. It was a truly amazing trip and this post has finally concluded everything to do with it. I'm hoping to get back to regularl reviewing in the next few weeks - so stay tuned.